Much of the music college students consume is produced partially or entirely with digitally produced sound. With a little practice and the right tools, they can make similar music themselves. There are simple tools and approaches students can take to jump right into producing their own tunes in no time. An understanding of music theory is not essential but can be beneficial to the quality of music production. Dom Giavonni, an independent music producer who works with several artists from the Inland Empire, affirms the value of knowing basic music theory. “An understanding of music theory is important. It helps you develop styles and understand where the music is going,” Giavonni said. One needs the tools of the trade. These include music production software, a beat pad or keyboard and quality speakers. There are a plethora of software options available, such as Logic X Pro, Ableton, Pro Tools and FL Studio. Any computer will suffice for music production as long as it is powerful enough to run the producer’s software of choice. Having an audio setup with a good interface to plug into the laptop is an important step. Some argue speakers are the most important part of the producer’s hardware. It is recommended to play the perfected sound on car speakers and low-quality systems to ensure it sounds good on all systems. As for keyboards, midi controllers and beat pads, there are many options, as well. Some feature two tools in one, such as the Akai Pro MPK. The last and most important thing to go into production with is positive mindset. Giavonni said it is valuable to have a lead element, support element and bass, just like a band with traditional instruments. Another learning curve is trying to produce the sound that is in the artist’s head on the actual software. Rachel Nix, sophomore music education major, said she experiences this challenge firsthand. “I can hear where I want a song to go in my mind, but technology isn’t in our minds, so we can’t just get a song just like we want it to be,” Nix said. 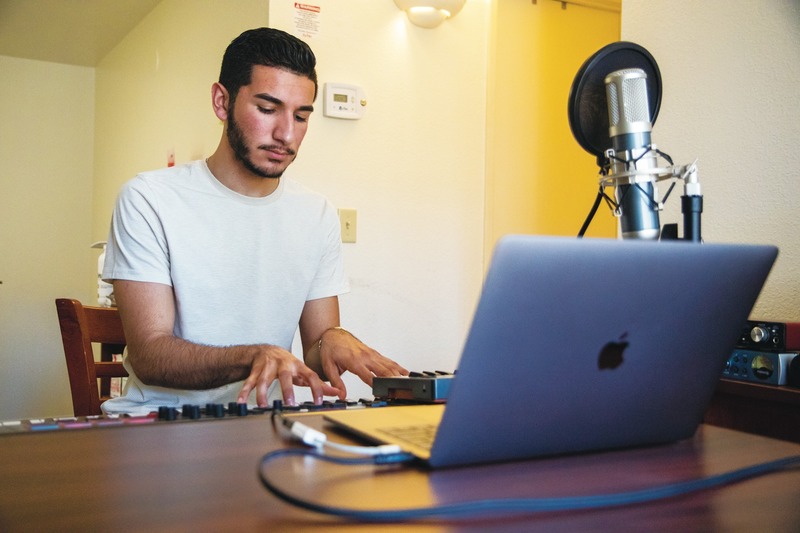 According to Joey Ramirez, sophomore worship arts major, music production takes time and practice to master. “Try to produce one track a day or a week because the more you produce, the more skill you can get and use,” Ramirez said.